Combine the parmesan and bread crumbs in a bowl and set aside. To make the filling, sauté the spinach with the garlic and olive oil. Put the spinach in a bowl and add the ricotta, garlic salt, salt and pepper. Mix well. Pound flat each chicken breast, slice in half and divide the filling amongst each. Roll the chicken up, dip in the beaten egg and coat with the breadcrumb mix. Place in the baking dish seam side down. 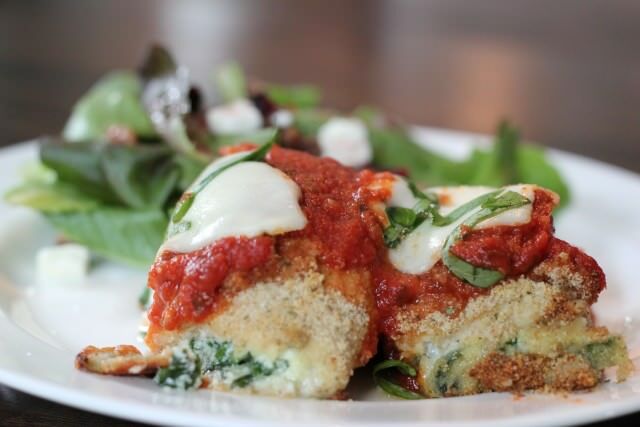 Remove the dish and top with the marinara sauce and slices of mozzarella. Return to the oven for about 5 minutes or until the cheese has melted.